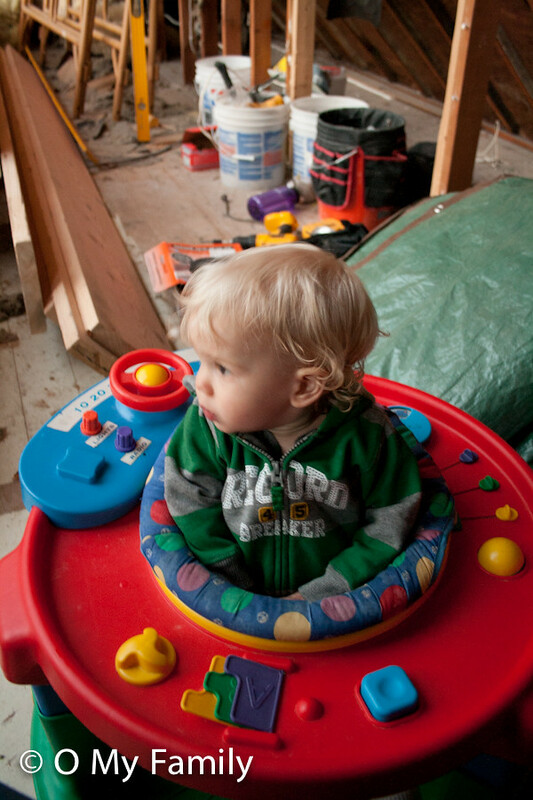 OBaby: as good a construction cheerleader as there ever was (with the exception perhaps of the needing to be sequestered thing). Yes, he was safe. Yes he was far from the action. No he could not reach anything dangerous (or anything at all). No, he was not breathing in anything dangerous. Yes, we were smart about it. There, you can stop worrying about our parenting decisions now. You’re welcome. HA!!! Are you being proactive or have people been pestering you? boo! i love you. that is all. Well of course he was safe…DUH! ;-) I certainly hope no one was stupid enough to think you’d put your child in harm’s way! I can’t believe you would put OBaby in an exersaucer so he could play safely under your supervision. Don’t you know he should have been left free to roam the downstairs, unsupervised? I really hate it when people criticize so quickly. It really makes absolutely no sense. All we see are what, 5 pictures? That honestly does not show everything. There is no possible way anyone could get enough of the story to really honestly know enough to be compelled to tell a (most likely) stranger how to parent (or have a happy marriage, but that’s another tangent). PS his face is precious. I had no doubt he was safe……and kudos on giving him the opportunity to witness the excitement of destruction and construction! I bet he loved that! hahhaaaha: I would LOVE to see the comments that brought that on!! he could not be cuter!!! It was just an email, wondering how we “justified” having him up there. Nothing too accusatory, but I figured if one person wondered/worried enough to shoot me an email, someone else out there was thinking it, too. Ah, the interwebs. I second the request to see the comments that brought on this post! He’s adorable! PLEASE tell me no one said anything to you and you’re just being proactive? PLEASE. Ugh! People are ridiculous! Never even crossed my mind that you would not be careful with your baby. Ha! Love it! My kid probably would have been down crawling around in that! Wait no…I’m a MUCH better parent than that and wouldn’t dream of it. Right. oh, well. THAT’S a relief. I would have had mine using the sledge hammer and saw. Just sayin’ . . .
Oh my, I wish I thought you were kidding, but reading the comments, I see you are not. Aye aye aye. And no, your photo at the top looks fine to me. Oh, sheesh! I wanted to say something witty, but I think all the fun above comments take the cake. Wow. None of those questions even crossed my mind. Am I going to be a careless parent someday? oh, I would totally have my kiddo in on all the action too! I mean, as long as he’s not eating the nails, he’s fine! Hey! I am leaving you a Lovely Blog Award for your lovely blog. Well how else is he going to get the Olfelt knack for home improvement?? I’ve had my kids in much worse…Hunter is tree climber that likes to cut down branches himself. Started when he was 9 or so. People always thought we were crazy.